In continuation with its focus on the AMG brand in India, Mercedes-Benz, today took the opportunity to tip the scales of limelight and popularity towards itself by launching the Mercedes-Benz ML63 AMG and inaugurating India’s AMG Performance Centre at T&T Motors, New Delhi. The event was graced by Mr Mario Spitzner, Director, Branding & Marketing, Mercedes-AMG. Now with two family-sized high performance AMG SUVs viz. 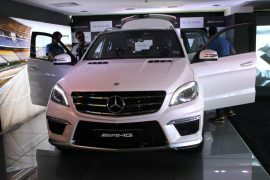 GL63 and ML63, the brand has further bolstered it luxury SUV portfolio in India. As far as the car is concerned, the specifications and features itself are enough to paint a lasting silhouette in your mind. And once you see the car, one can only bask in the glory of craftsmanship and panache which the engineers at Affalterbach – the holy grail of AMG – have managed to achieve. 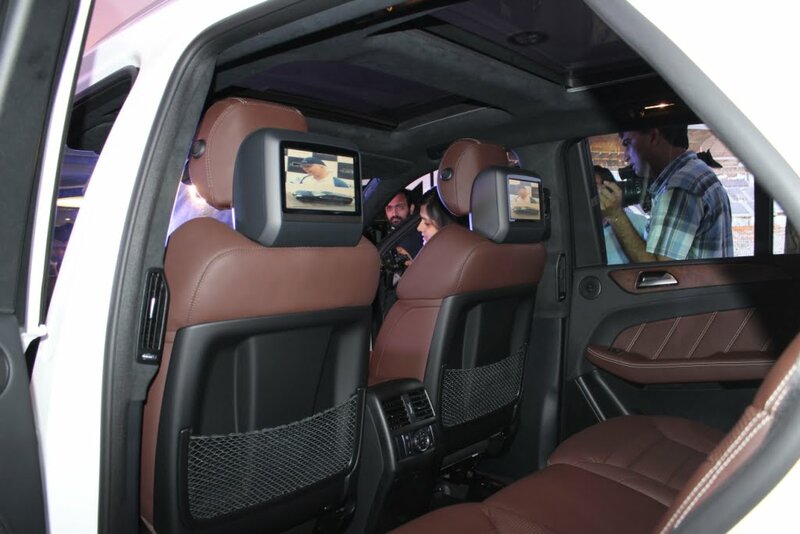 Every inch of this vehicle exudes cutting-edge material, technology and grace. 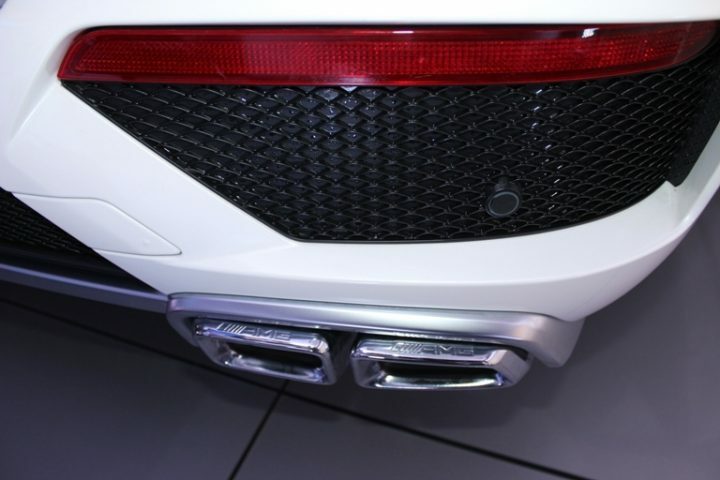 Right from the high adrenaline screams from the exhausts to the ethereal ambiance inside which pampers you, the SUV is a touchstone of luxury and performance. 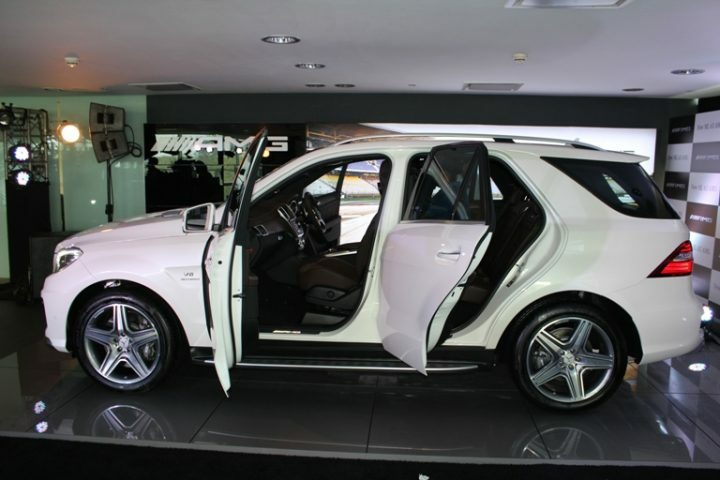 For the first time ever, Mercedes is providing the ML63 AMG with the ‘AMG performance package’ already included. 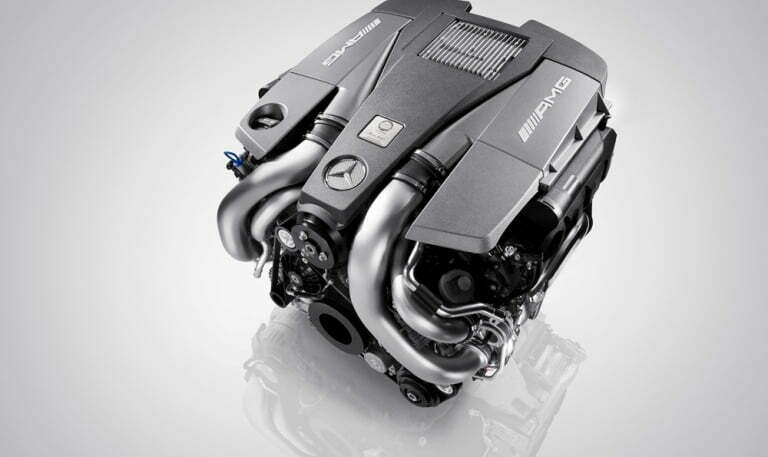 This has been done to bring the engine performance of the same, at par with its big brother, ergo the GL63 AMG. Hence the car carries the AMG 5.5-litre, twin turbo V8 engine which produces 557 BHP and 760 Nm. The compression ratio is maintained at 10:1. On a clear road, all you need is some audacity and this will clock 0-100 kph in 4.7 sec with ease. 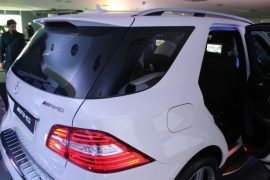 The SUV has been electronically limited to 250 kph. In spite of the power delivered, the ML63 AMG returns 8.4 kmpl in the NEDC (New European Driving Cycle) and conforms to EURO 5 standards. 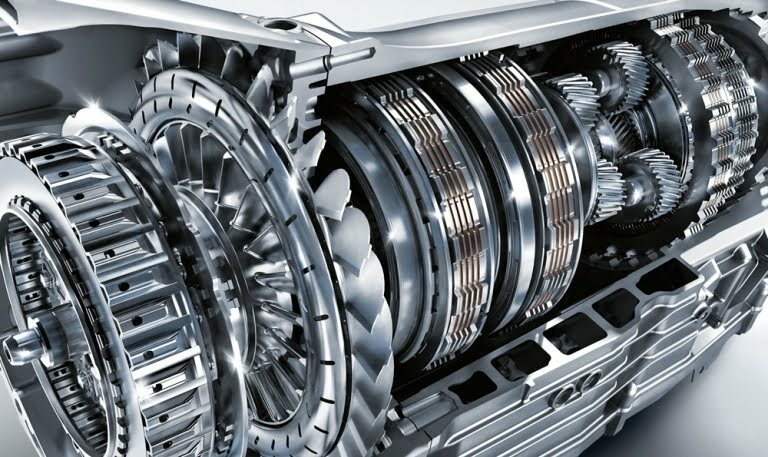 To enhance efficiency, the AMG SPEEDSHIFT PLUS 7G-TRONIC automatic transmission incorporates a fuel-economy converter with centrifugal pendulum, bearings designed for reduced friction loss and a transmission-oil thermal management system. Friction loss-minimised axle gears, electromechanical AMG speed-sensitive sports steering, an optimised belt drive and demand-responsive control of all ancillary units and pumps also help to reduce fuel consumption. 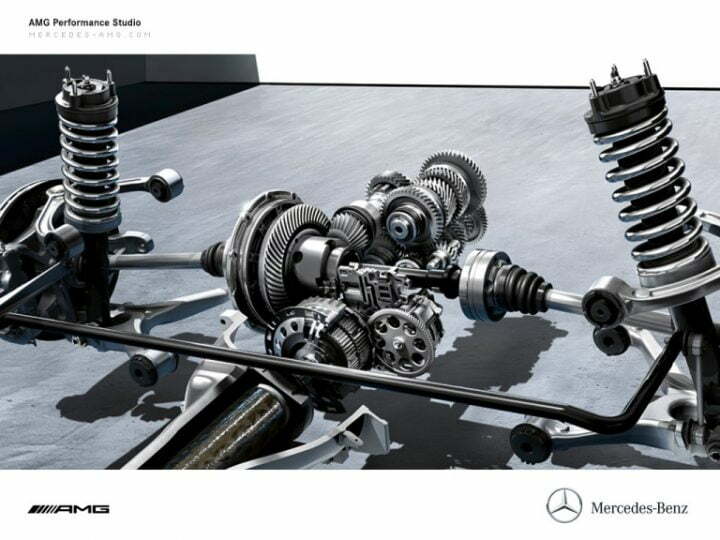 The enhanced drive train delivers the best possible power transmission and hallmark Mercedes reliability. Mercedes-AMG deploys a specially designed transfer case for the 4MATIC permanent all-wheel drive, which distributes the drive power to the front and rear axle at a ratio of 40:60 in the interests of dynamic handling. In addition, the AMG RIDE CONTROL sports suspension with AIRMATIC package – consisting of air suspension, special damper struts, automatic level control and Adaptive Damping System (ADS) – is combined with the ACTIVE CURVE SYSTEM for active roll stabilisation. Active anti-roll bars on the front and rear axles are employed to reduce the body roll angle during cornering. Apart from enhanced agility and driving pleasure, the ACTIVE CURVE SYSTEM has the additional effect of increased handling stability and therefore safety, particularly at higher speeds. Roll stabilisation, damping and suspension adapt automatically to the prevailing driving situation, offering both optimum drive comfort and maximum stability. 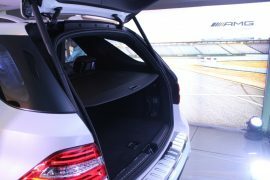 The ML63 AMG driver will be able to choose at the push of a button between the three driving modes “Controlled Efficiency”, “Sport” and “Sport Plus”. 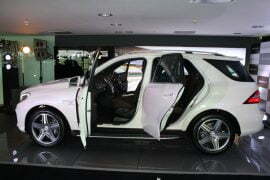 One the inside, the SUV gives you a plush race car ambiance with AMG blessings all over the place. Even before you completely open the door, the generous AMG ambience that is characterized by exclusive and high-quality details unfolds, such as the door sill panels made of stainless steel, the AMG sports seats with leather upholstery and the AMG performance steering wheel with its silver-colored aluminum shift paddles. Integrated in the instrument panel, the AMG instrument cluster – equipped with a large color display – draws your attention. And in the foot well, the AMG floor mats and the AMG sports pedals made of stainless steel with rubber studs round off the impression. The AMG-specific instrument cluster with 11.4-cm multifunction color display features the trademark tubular-design main dials with aluminum trim, AMG-specific lettering. 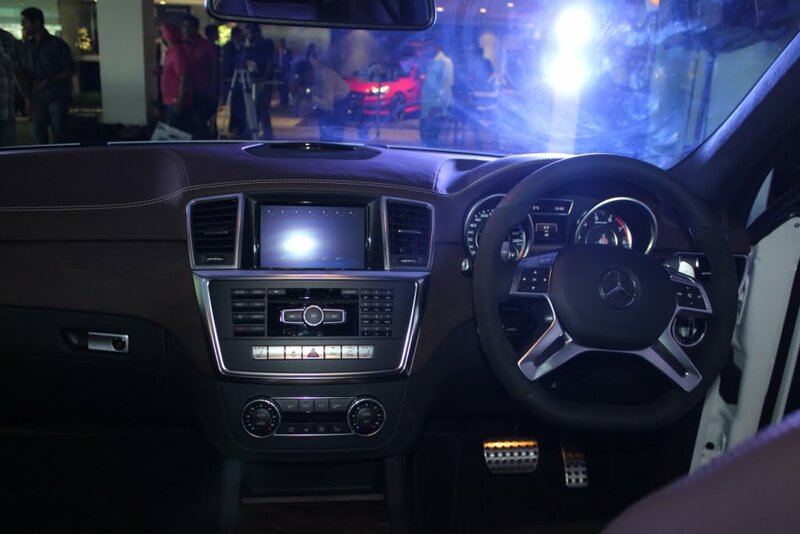 Eye-catching details include the 320 km/h speedometer scale, red needles and the AMG logo in the tachometer. 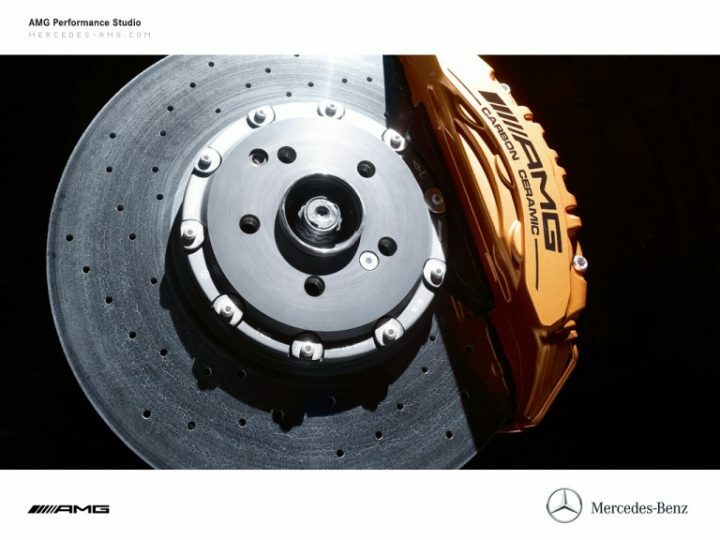 The main menu with RACETIMER is an AMG exclusive. The new AMG performance steering wheel in nappa leather with its flattened bottom is distinctive; the specially molded grip area is covered with perforated DINAMICA microfiberleather, and both lower steering wheel spokes feature a silver insert. New AMG aluminum shift paddles enable manual gear changes. 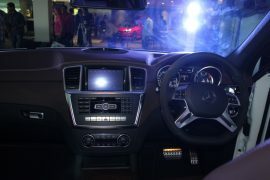 The steering will also have controls for the Harmon Kardon 830 W entertainment system. 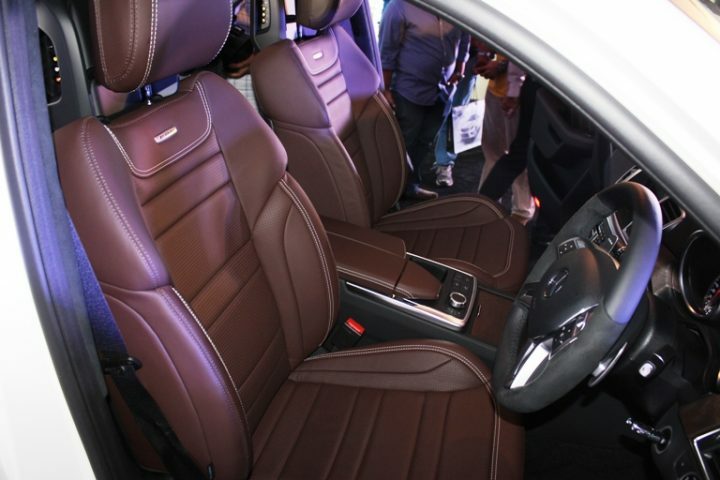 The ultimate in comfort and the ultimate in ergonomic precision, the AMG sports seats combine luxury with performance. The side bolsters hug driver and passenger alike, holding both firmly in place while providing a better feel for the vehicle and the road. 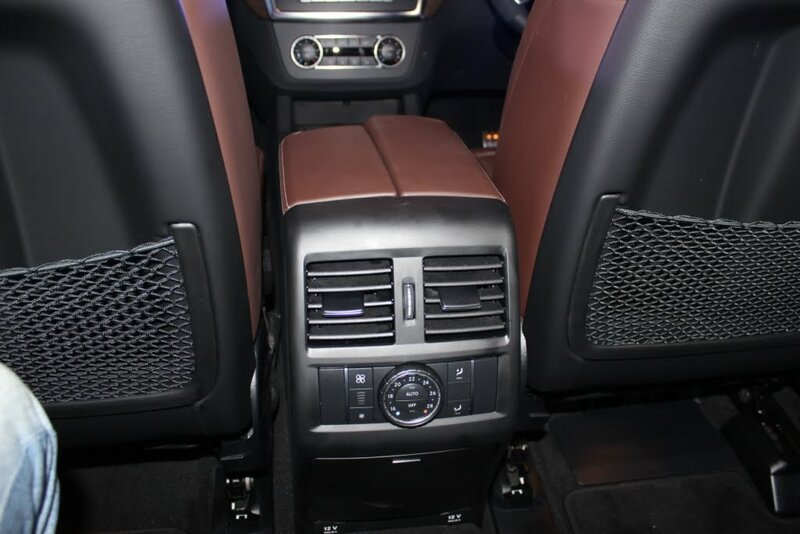 The seats are upholstered in exclusive leather, to match the front and rear door panels, armrests and handles as well as the center console. The AMG sports seats with AMG specific seat pattern and decorative AMG badges are exclusive details that distinguish the ML63 AMG from other vehicles. AMG brushed stainless steel door Sill Panels — when you climb aboard, the AMG experience continues, setting the ML63 AMG apart with striking door sill panels boasting a distinctive AMG logo. 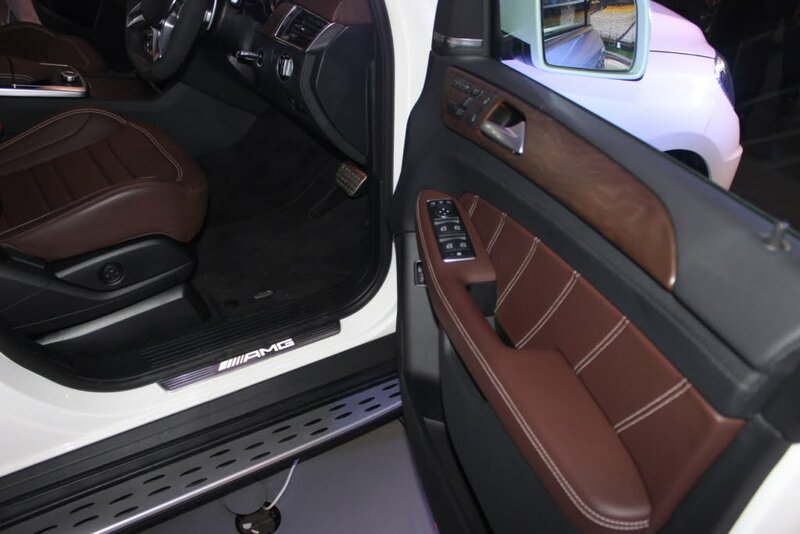 In combination with ambient lighting, the AMG door sills are illuminated in white light. Sports pedals made of brushed stainless steel with rubber studs for a better feel. Exhilarating performance meets industry-leading safety. 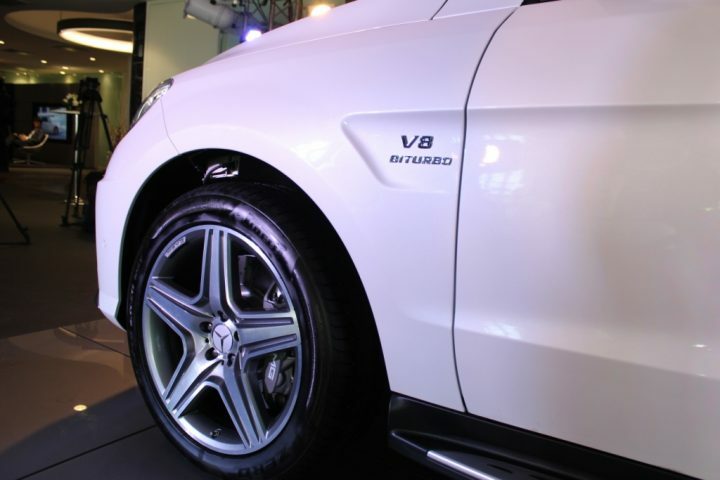 The ML63 AMG is equipped with an AMG high-performance braking system to decelerate the power of the engine effectively when required. Single-piston sliding calipers at the rear wheels, again with internally ventilated, indented brake discs, diameter 345 mm, thickness 26 mm. 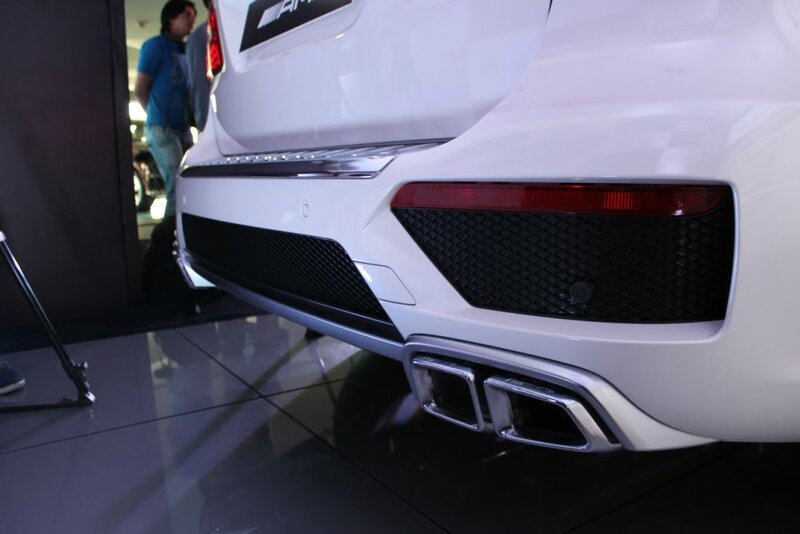 AMG sports exhaust system with two chromed twin tailpipes: a mark of visual distinction, raw power, and exhilarating acoustic sound. Viewed from the side, the 20-inch AMG light alloy wheels are distinctive. The 5-spoke titanium grey rims are fitted with 265/45 R 20 tires. Bottomline, with a high-performance and efficient engine, an intelligent gearbox, seating and riding comfort which surpasses the possibilities of ergonomics and the many AMG badges, the owner will have the bragging rights for eternity. Do let us know what you think of the new ML63 AMG in the comments section below.